Sherry writes: I’m almost ashamed to show you the inside of my fridge, but I’ve been out of town for nearly a month and I had totally emptied it. Now I came home last night with a quart of milk (for my morning coffee), salad dressing, and some butter pats (which I hoard from a local bakery). The thing is I just rashly invited a colleague for dinner at my place and here’s my question: starting from a bare fridge like this, what can I make quickly that requires the shortest imaginable shopping trip? I don’t mind if we eat pasta and I don’t mind spending some time in the kitchen to make something, but I do NOT want to spend an hour in the supermarket replenishing my stores. For dinner, I’d like a quick nibble to go with wine and then a simple menu if possible (maybe salmon?). Tony’s take: So this is interesting. A lot of times, people are trying to figure out a way to sustain themselves without leaving the house. 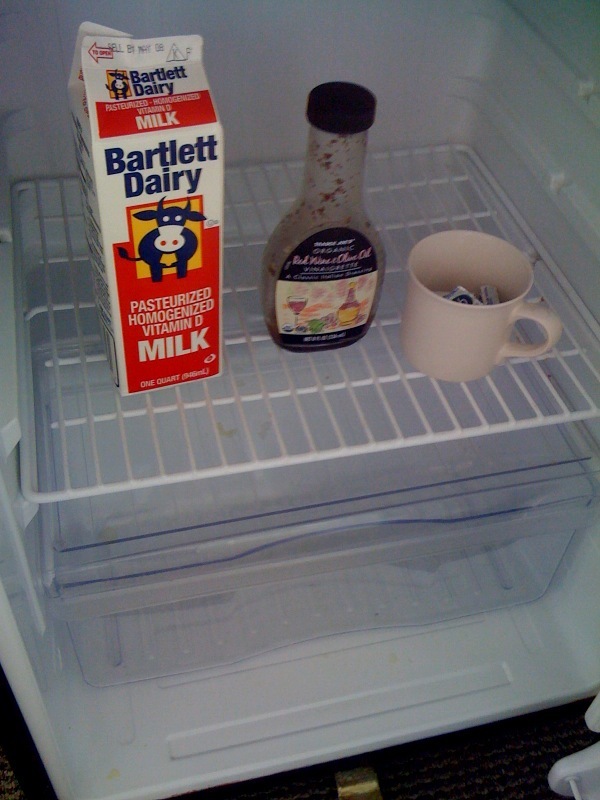 You, on the other hand, aren’t kidding about really having nothing to work with (that’s one empty fridge! ), but you are willing to make a surgical strike on a local market – a 5-minute grab-and-go for 10 ingredients or so –, so a really nice meal should be easily within reach. My advice is to go with a very austere (Craft-type) approach. Pick up some salmon filets (wild Pacific salmon is available right now and a far more tasty – and sustainable- than the farmed stuff) and prepare them simply with high heat (saute?). Because salmon is a little funky, forget about a pan sauce and instead pair it with something simple – make a sauce out of some crème fraiche, a little horseradish, and a fresh herb (thyme?). To go with the fish, pick out whatever vegetable looks prettiest at the market (asparagus for broiling?) as well as a rustic loaf of bread that’s more interesting than a baguette (olive bread?). For the nibble, how about marcona almonds? Pick up an 8-oz pack, warm them in the oven for 10 minutes, and then toss with the same fresh herb you used in the sauce (thyme? ), brown sugar, and a little pimenton de la Vera. All in, this should be 10 minutes in the supermarket, 20 minutes of hands-on time, and 20 minutes of cooking. How to do it: For the almonds: Heat the oven to 425F. Toss the almonds (about 8 oz. or 2 cups) with a splash of olive oil and some kosher salt (about 1/2 tsp.). Spread in a single layer on a rimmed baking sheet lined with aluminum foil and roast, shaking the pan occasionally, until the almonds start to turn light brown and become fragrant, about10 minutes. Transfer immediately to a medium serving bowl and toss with some brown sugar (about 1 Tbs. ), chopped fresh herbs (about 1 tsp. thyme or rosemary), and a light sprinkling of pimenton de la Vera or chipotle powder (between 1/4 and 1/2 tsp.). Serve warm. For the horseradish cream: Mix 1 cup creme fraiche (or sour cream) with a good dollop of prepared horseradish (2 to 4 Tbs. ), a squirt of lemon juice, chopped fresh herbs (about 1 tsp. thyme if you have), and salt and pepper to taste. Add more lemon juice and horseradish to taste. For the salmon: Give the salmon (about 2 lb. for 4 people) a quick rinse and then pat dry with paper towels (make sure to do a good job so it browns nicely and doesn’t stick to the pan). Season it generously with salt and pepper (about 3/4 tsp. and 1/2 tsp. respectively). Open up any kitchen windows if you got ’em (the salmon will leave a lingering smell). Heat a good splash of olive oil (1 to 2 Tbs.) in a large (hopefully 12-inch), nonstick pan over medium-high heat until it’s shimmering hot, about 1 1/2 minutes. Add the salmon, evenly spaced and skin-side up, and cook without touching, until it browns around the edges and easily releases from the pan when you pick up a corner, 2 to 3 minutes. Flip, reduce the heat to medium, and cook the other side until it, too, browns and becomes just firm to the touch and is a little pink in the center when you slice into a thicker piece, 2 to 3 more minutes. Serve the salmon with a dollop of the sauce, a squirt of lemon if you like, some broiled asparagus, and a good loaf of bread. Enjoy tonight and then think about going to the supermarket tomorrow.